I'm Affinity iPad newbie. Looked high and low and tried all I can, but.....how does one copy a selection to a new layer that can be blended with the original layer? Something I do easily and repeatedly in PS. Yes, I can do it on mainframe Affinity. First go into the selections persona,make your selection. Go back into the photo persona, select the commands menu, pasteboard, copy. Go back to the selections persona, select the commands menu, deselect. Go back into the photo persona, select the commands menu, pasteboard, paste. This creates a new pixel layer with the selection on it. Great knowledge here. Posting, so I can dig up my content in the profile options, in the future, and grab this intel in case I forget. I cannot find the way to create shorthands for current actions ? I am afraid there is no way to shorten the process. tap the screen with two fingers again and select Paste (tap the canvas again with two fingers to quickly Deselect the selection too using the popup menu). Yes, this is a known issue that's already logged/assigned to be looked at. Sorry for the inconvenience. Once you have an active selection on a pixel layer, switch to the Photo persona. This creates a new layer containing only your selection. Trying each of these methods to select an area of a photo. I can duplicate the entire photo, but I cannot figure out how to duplicate just the part within the selection. The way that I can get it to work is to start with project using Import From Photos. When I do that I can make a selection, then switch to Photo persona and two-finger click duplicate. Only the selection is duplicated. I can resize the original image, move it around, whatever before I make the selection, the duplicate selection still works. But if I import a new photo to a new layer and try to duplicate, the entire image is duplicated. 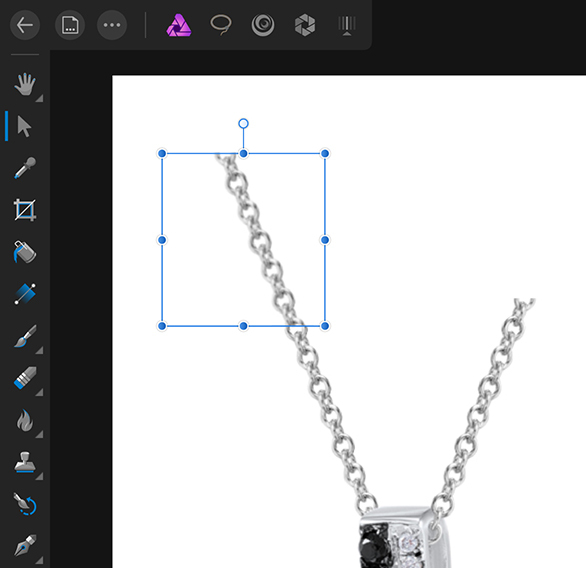 I assume that once I draw that selection, whatever layer I navigate to and select will be the target for my duplicate and only the portion of the image within the selection will be duplicated. But this is not working. Only the originally selected area remains. As expected. That's because you are trying to copy from an Image layer type (check the small letters above the layer's name in the Layers Studio). You have to rasterise the layer first to convert it to a Pixel layer so you can edit/manipulate it at a pixel level. To do it go to the three dots menu on the top (in Photo Persona) and select Rasterise ▸ Rasterise. You can then copy/paste just the selected area. Image layers are considered object layers: you can transform them as a whole (scale, rotate etc, and apply non-destructive filters/adjustments) but you can't change/manipulate them directly at a pixel level because they retain all original image data so all that operation can be done without losing quality. So to be able to manipulate them directly you have to convert them first to pixel layers as described above. I'm really confused by the layering processes in this app so please forgive me if this is a basic question. How do I use a black and white image as an alpha on my background? example: i have a tree on a grey sky. I created a high contrast black and white of the image to separate the tree from the sky. How do i use that high contrast image as a mask to help replace the sky? Select the high contrast image then tap the three dots on the top left of the app interface and select Rasterise ▸ Rasterise To Mask. Hello! I'm Affinity iPad newbie and I have a problem with quality during the transformation. After Rasterise ▸ Rasterise my image lost quality after each move. If I want to cut the selection and transform it, it becomes blurred after one move. What can I do to save quality?